Hi beauties, as you already know, leather garments are one of my signs of identity, and I specially love them if they have any amazing detail. 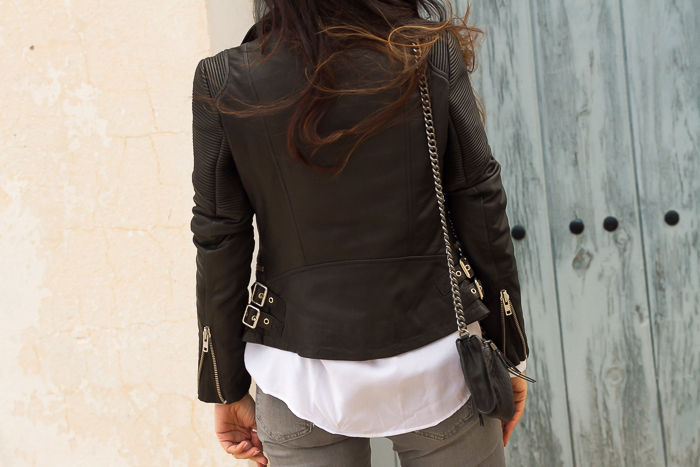 This leather biker jacket by Muubaa is one of them, it makes me crazy because it is sooo pretty and because its lining let me wear it also in winter season. que me tiene loca, es preciosa y como está forrada, la podré usar incluso en pleno invierno. Today I have mixed it with a gorgeous pair of grey skinny jeans which fits perfectly and with cowboy ankle boots in taupe colour. This is a very simple and comfy outfit but it works! Don't you think so? Thank you so much for all your comments. Kisses!! Hoy la he combinado con unos jeans grises que sientan como un guante y con botines camperos en color gris topo. Una combinación sencilla y muy cómoda. ¿Qué os parece? Un besazo y que tengáis un feliz día. y lo que me gustan los vaqueros grises! tu siempre estas sencilla pero divina! Estas preciosa ,ese biker es ideal,me encanta ,besazos. I like very much your look and I love your biker jacket! La biker es impresionante, me encanta! Great outfit, this look is very nice, it's prfect for you! Te sienta perfecto este look! Los botines me han enamorado, vivo fuera pero en cuanto vaya a España me cojo unos así, son muy ponibles, y allí valen mas baratillos jejeee. This is a perfect look, love the jacket and those shoes ! Me encanta la chaqueta es preciosa!!! Lindo outfit! I love the motto jacket against the grey and white look. Pues sí, a veces no hay nada más efectivo que recurrir a las prendas que nos gustan y nos sientan bien.